When it comes to Apple and Samsung they are fierce rivals. But will that rivalry carry over to the budding smartwatch space? If it does, then we couldn’t see two more dramatically different approaches. 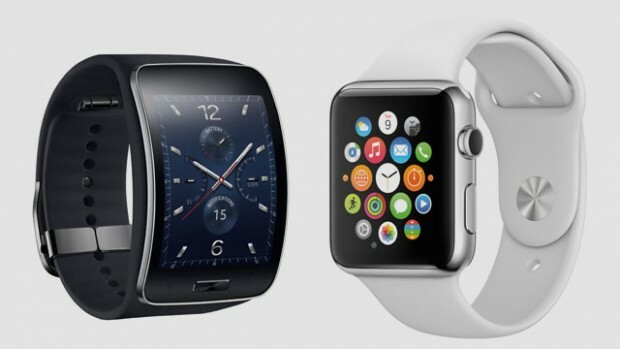 Let’s compare the Apple Watch to the Gear S.
Many people prefer Apple, because it’s better than Samsung. But, there are many other people who prefer Samsung than Apple. In a recent survey 58.8% prefer Apple and 33.64% prefer Samsung, and that 93.57% of people felt at least somewhat loyal to their brand. Only 3.17% felt little or no passion for their device. Apple watch and the Samsung Gear S has many interesting features. Here are a few of the features on the Apple watch: Digital touch- This feature is Apple’s way of advancing communication. Users can draw quick images to friends, using minimal effort. This other feature is related, is the Watch’s Taptic Engine, which alerts you of notifications with just a simple tap. You can also use this feature to send taps to a friend to get his or her attention. Animated emoji- The little graphic images can be customized. You send a smiley also you can make it wink or make its tongue stick out. Thats pretty cool! Here are some of Samsung Gear S features: Advanced Communicator- allows you to call and answer incoming calls, also send messages and receive. Even when you are away from your phone. Personal fitness monitor- It has a built in GPS and robust S health features. Also with the personal fitness monitor it has Nike+. To wrap it all up Apple and Samsung are fierce rivals. Although many people prefer Apple than Samsung, but it is also the other way around. I wonder who will still be the best company. What do you think?